This blog is still new and who knows where it will go, but the real reason I first started thinking about blogging was for baking. I have always loved to bake. Before healthy eating, running and everything else, there was always baking. It has been a stress reliever, a creative outlet, my way of showing appreciation for others, and always a really good time. 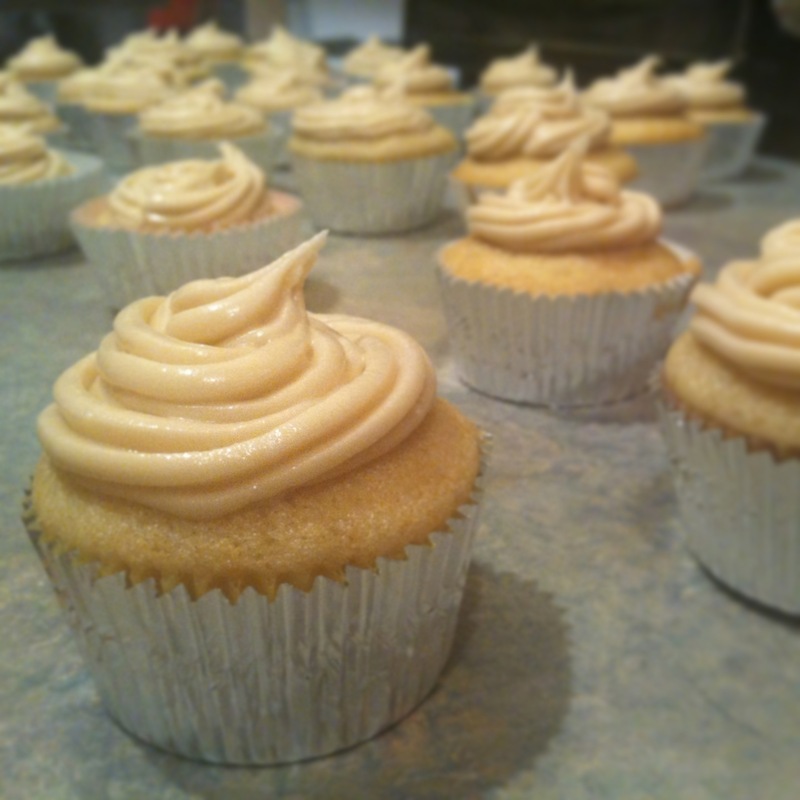 This week I whipped up a special treat for a co-worker’s birthday: White Russian Mini Cupcakes. These were delicious, simple and much appreciated by the staff on a slow Friday afternoon! I am definitely planning on turning up the heat and posting a lot more recipes and baking adventures on this blog – stay tuned for more posts, and will be updating the Recipes tab as well! 2. In a medium bowl mix together flour, baking powder, and salt. Set aside. 3. In a large bowl, beat together the sugar and butter until combined. Add the egg, mix, and then add the egg white. Next add the vanilla, Vodka and 1/8 cup of Kahlua. 4. Gradually add the dry ingredients and the milk, alternating, ending with the flour mixture. 5. Bake 17-20 minutes. Immediately after removing from the oven, brush the tops with remaining 1/8 cup of Kahlua. Remove from pan and cool completely on a wire rack before frosting. Beat butter until creamy. Add salt. Add powdered sugar 1 cup at a time, mixing until combined. Add Kahlua 1 tablespoon at a time, until you reach desired consistency.